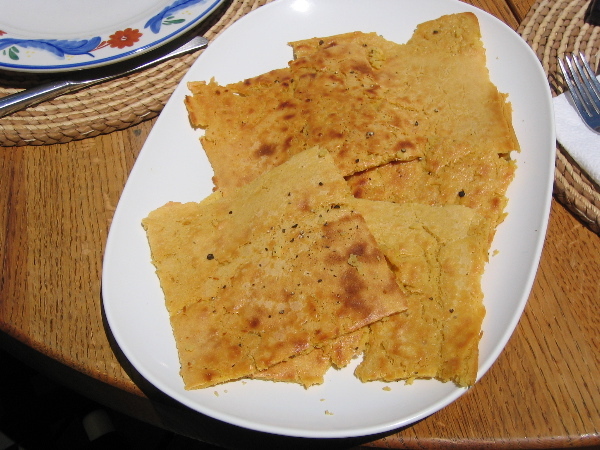 On Saturday morning, I woke up with a need to eat soca (standard French socca), that quintessential outdoor food of Nice that is but a simple, thin and flat cake-like baked good made from chickpea flour, water, olive oil and salt. Baked quickly at high heat, the Niçoise soca and it’s Ligurian counterpart fainá (standard Italian farinata) is a remarkably flavourful dish, best finished with nothing more than a bit of freshly ground black pepper. To satisfy my desire, I headed off to buy some chickpea flour at Graziano's and the next day, I had my chance to make this simple dish. Along with our soca, we also had some delicious fresh Italian bread from Masi’s Italian Superior Bakery and a couple of plates of cheese with appropriate accompaniments of crudités and olives. To the left is l’assiette à la napolitaine with fresh mozzarella, tomato, just picked basil, kalamatas (we were all out of Gaetas) and olive oil from southern Lazio; in the middle toward the back is l’assiette à la grecque, with Greek feta, cucumbers, onion, parsley, pickled Greek hot peppers, green olives from Thessaloniki and olive oil from Crete. 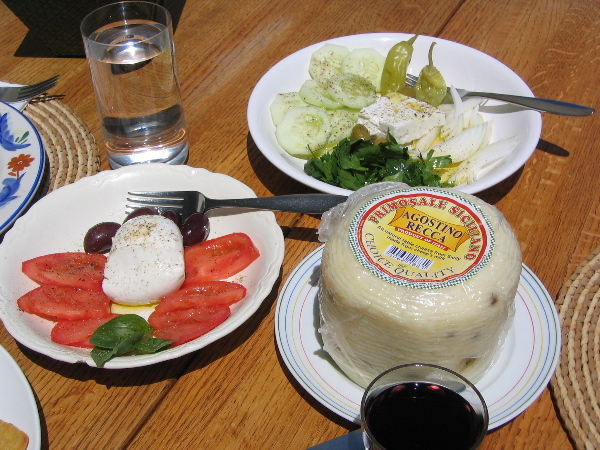 To the right in the foreground is a two pound form of Sicilian primo sale, that is, a youngish pecorino or sheep's milk cheese, in this case with whole black peppercorns. Incidentally, the chickpea flour required for the making of soca I purchased at Graziano’s on Randolph(link) at a cost of only about $1.75 per pound. The primo sale was also purchased there at about $6.50 per pound. Last edited by Antonius on May 24th, 2005, 1:08 pm, edited 1 time in total. The weather has me in a similar mood, manifested in a recent pesto with hand-made trofie and focaccia with sage. 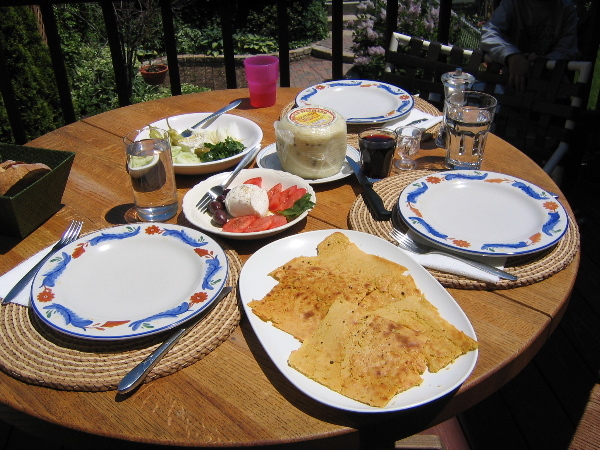 For those who want to taste the stuff that Antonius made, I know that socca is the specialty of the house at the new Wrigleyville restaurant of the same name and that the caffe across from D'Amato's #1 (Buongiorno, IIRC) has sandwiches with the Sicillian chickpea cake, panelle. I can't vouch for either, since I have yet to try them. But I figured maybe someone here has by now.